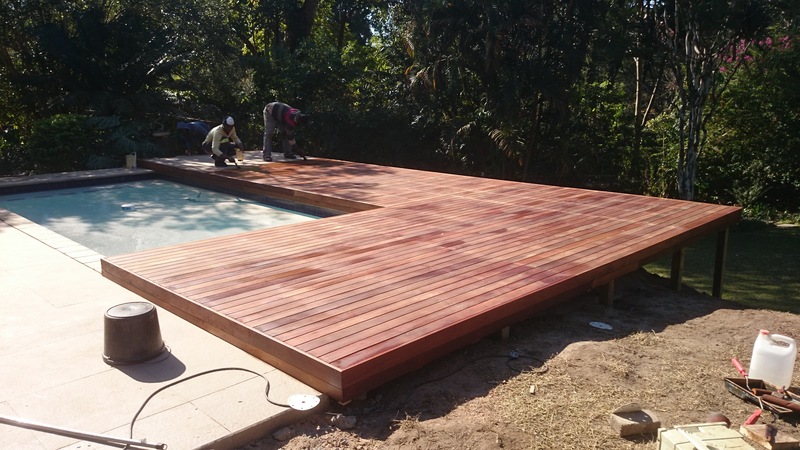 We engaged with Masslandscapes, a landscaper and garden designer (082 468 3759) on this balau pool deck project in Kloof, Durban to provide a solution for the client who wanted an area alongside their pool that they could utilise more. Before the project started there was the standard paved area of about 1m alongside the pool which was bordered by grass of about 1m and then a flower bed, before dropping down a small bank to the rest of the garden. The client wanted to increase the size of usable area alongside the pool. Initial designs were to have a very similar layout as per the pics above with a semi-circle sort of node protruding over the bank to gain height and create a look out area overlooking the Kloof Gorge. This proved to be out of budget and would probably have resulted in doubling up sitting area as there was already a large tiled verandah extending out from the living area doors. The final design was settled on which is what you see in the pics. We needed to excavate some of the garden down and move this top soil for use in another area of the garden. It is always recommended that sufficient space be left below the deck and below the bottom of the lower most bearer or joist to allow enough air flow to dissipate and evaporate any water that settles below the deck. Too often I have seen deck boards rotting prematurely due to insufficient space being left below. Water gets trapped below and the underside of the deck and structure remains damp. I normally recommend at least 150mm below the lowest point of the structure. Once we had enough space below we installed our structure using H3 CCA treated pine. Please see here for an article on the use of CCA Treated pine as structures for decks and balau as deck boards. All cut ends of treated pine, as a matter of course, are re treated with an approved end sealer. When a CCA treated piece of pine is cut it exposes a section that is not treated and can accelerate rot. Post to ground are set in concrete and installed at the correct distance on the bearers to stop any bounce in the bearer and to provide enough support to prevent the bearer breaking. There are guidelines supplied by engineers for distances that these supports need to be installed. These posts need to be H4 CCA treated pine as they are in constant contact with wet soil. A lot of this job involved lining up existing paving, pool copings, patio etc. to the deck so the lines were seamless and everything ties in neatly. A walkway, as can be seen from the pics, was created to run alongside the existing raised patio for access to the rest of the garden. In finishing our decks we fill the screw holes with a clear epoxy mixed with saw dust to match the colour as closely as possible and then grind and sand it flat. Standard wood filler doesn’t quite do the trick and fails with exposure to weather. The filling of screw holes is a very important aspect of deck building. It prevents water sitting in the counter sunk screw hole which would then travel up the end grain of the balau and cause early rotting of the balau deck boards. We use a clear epoxy so that we can match the colour to the deck boards. Off the shelf epoxies are either grey or white in colour and don’t take the saw dust that well to match the colour. Also these epoxies dry very hard. It is better to use an epoxy that is semi pliable when dry. Through seasons of dry and wet, hot and cold, the inside diameter of the counter sunk screw hole will vary ever so slightly. If the epoxy has dried too hard it will cause it to pop out leaving a weak spot on the balau deck board. During maintenance intervals these should be checked and replaced if they have in fact popped. The deck was oiled using a zero wax content product. The beauty of oil is that it soaks into the wood and therefore cannot peel and flake. A peeling deck is an expensive deck to maintain because you would need to sand off the coating completely to avoid a patchy finish when re-applying the coating. Whereas an oil simply degrades due to exposure to UV over time. A pressure wash and re-oil is all you need to do at maintenance intervals which is relatively inexpensive and easy to do as opposed to sanding the deck again. The oil also allows the natural beauty of the wood to shine through resulting in a more natural wood looking product. Coatings give them the effect of a painted deck especially over time when layer after layer has been applied. For a free no obligation quote on your timber balau decking, walkways, pergolas and other outdoor timber products, please call us on 031 – 762 1795 or use the contact us form below. We operate throughout KZN. 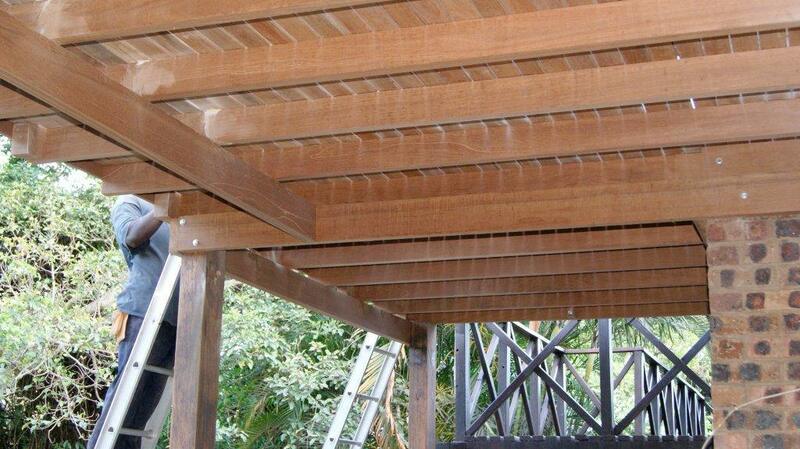 I often get asked about using balau as a substructure in a wooden deck. 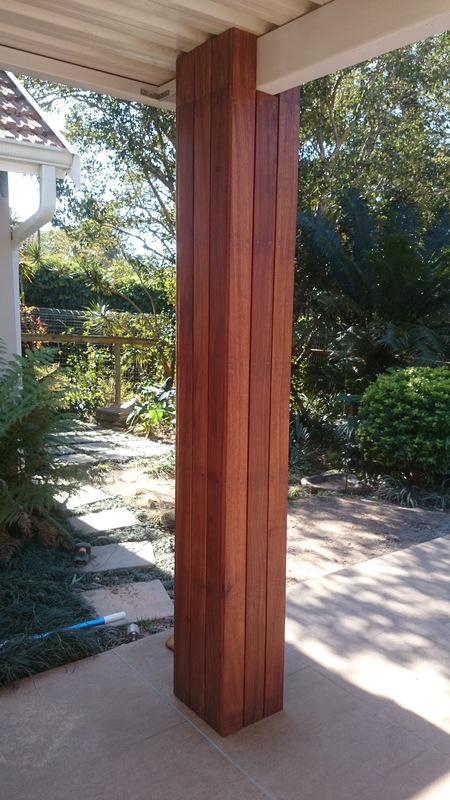 There are various pros and cons of using balau as a substructure in your wooden deck so I thought I would jot it down and in future I can direct clients here who want the ins and outs of using balau as a structure for your wooden deck. Balau is a very good, hardy and durable wood to use in outdoor wooden decks and other outdoor projects. It contains toxins that limit insects eating it and it is high in resins and oils which naturally repels water and limits rot. All wood will eventually rot. It is just that some will rot quicker as they are less dense and less oily which means they will absorb water more easily, which remains in the wood, causing fungus to grow which breaks down the fibres in the wood and is commonly called rot. This is a simplified explanation but I think it delivers the message accurately. Water doesn’t cause rot. Fungus, as a result of water and sunlight, causes rot. Balau therefore will rot and I have started documenting some pics of rotten joists that I have come across in my repair work of wooden decks. It may take 15 years for this rot to start but it will happen and when it does repair work can run into thousands if not a complete deck rebuild. Joists are often difficult to access whereas deck boards are not. On the other hand a piece of wood that has been chemically treated to prevent, or limit rot, will last a lot longer and a pre determined life span can be calculated. CCA Treatment is a process of pressure treating SA pine. A vacuum is created in a chamber that contains the pine and a solution of copper, chrome and arsenate is introduced which then takes up the void created by the vacuum sucking the solution into the cells. The copper prevents fungus growing which in turn prevents rot, the arsenate keeps the insects away and the chrome binds the two to the wood so that I doesn’t leach out. Balau is too hard and dense to treat. Pine is a commercially grown timber in South Africa which is inexpensive and very suitable for treatment as it is soft and takes up the solution of CCA successfully. There are various different Hazard Classification or H classifications. Basically H2 is good for indoors (roof trusses etc.) H3 for outdoors exposed to the elements, H4 for in constant contact with wet soil. H5 for submersion in fresh water and H6 for submersion in salt water. A correctly treated piece of pine to H3 will, as per SAWPA guidelines, last in excess of 50 years which is pretty impressive in comparison to a piece of balau that comes with no fixed life expectancy. A poor quality piece of balau may start to fail within 5 years whereas a good quality piece may only start in 15 years. Most of the pics I have documented here are of decks that range in age from 8 years to 15 years. But generally speaking I have found some rot setting in all the decks of 15 years or older. S5 (SABS Structural grade) Pine is considerably cheaper than balau structural timber. So from an economic point of view it makes sense to use pine in place of other woods wherever possible. One might now ask why is pine not used on the surface of a deck? Why is balau preferred? Balau is a very stable wood and therefore expands and contracts less than pine. It is about twice as dense, knot free and doesn’t twist and warp as easily. Pine is soft and with the sun beating on the deck it will tend to crack, twist and warp more easily. To use pine as a deck board one needs to use a 38mm board as opposed to a 19mm board in balau (twice as much wood). Also pine deck boards are normally manufactured from S7 as opposed to S5. S7 refers to the number of knots per square inch (or centimetre) and is therefore a lot more expensive than S5. The cost of pine deck boards is in fact a few rand more per square metre than balau. Hence the reason to use correctly treated CCA pine as a substructure and balau as deck boards. Again pine doesn’t work well in balustrades because twice as much wood needs to be used at S7 grade. For a free no obligation quote on your sun deck, pool deck, balustrades, pergolas etc., please call us on 031 – 762 1795 or use the contact us form below. 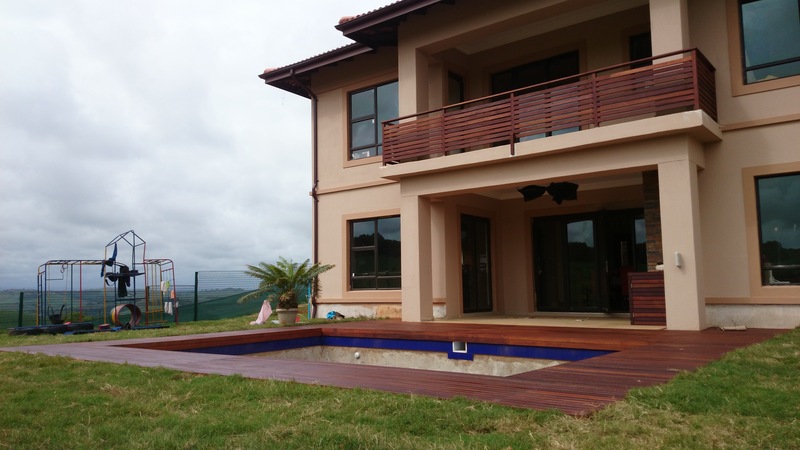 Wooden decking in Durban, or any other area in South Africa is a valuable, inexpensive way of creating extra outdoor space. The climate in South Africa lends itself to outdoor living and as such a wooden deck in Durban is almost essential. There are many articles on this blog on how to build a wooden deck, what methods we use in building etc. so please feel free to browse and find what you are looking for. In this article I will mention some of the types of wood we use in building our wooden decks and provide reasons why we choose those types of wood. times the price of treated pine. Balau will rot quicker than correctly treated pine in a substructure, believe it or not. The pine that needs to be used in the substructure needs to be at least S5 which is SABS structurally approved timber. What it means is that there is no more than a certain specified amount of knots per square metre of timber. Pine is very knotty and is split up into different S categories which all carry a different price tag. contracts a lot more than balau. This is fine for a substructure which uses thicker pieces of wood and is protected from the sun, but doesn’t work well on deck boards. Based on all the above, it makes financial sense, and structurally it is the best option, to use H3 and H4 CCA Treated pine as a substructure and balau deck boards. and warping, they can withstand minus 10 in winter and plus 30 in summer. Durban however has a more stable climate with less extremes between seasons and as such balau is the most suitable choice for hardwood decks. For a free no obligation quote on your wooden sun deck in Durban please call us on 031 – 762 1795 or use the contact us form below. We are a timber decking company based in Durban and specialise in the construction of timber sun deck, pergolas, walkways, stairs etc. We use primarily H3 and H4 CCA treated pine as our substructure and balau deck boards. Our balustrades and stairs are all made from balau unless otherwise specifically designed in pine. The H3 and H4 CCA Treated pine has a life span of between 30 and 50 years outdoors in the elements and although the balau is not pressure treated it will also last in excess of 30 years. 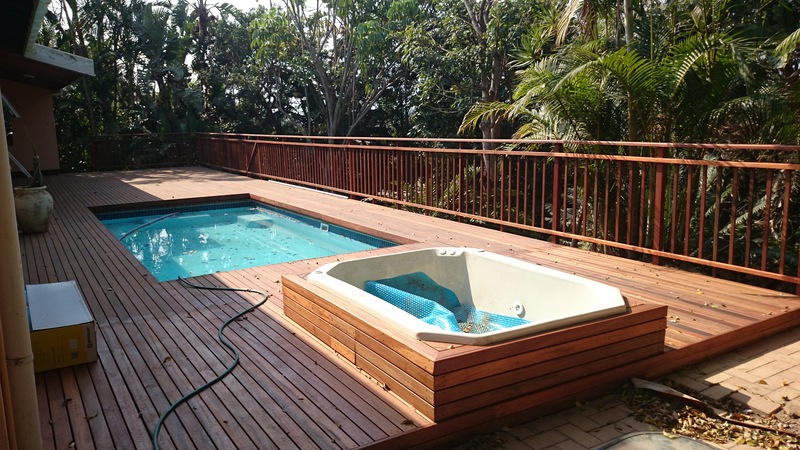 The timber deck we built in this article was in Plantations in Hillcrest and was a low-level pool deck. The pictures alongside show the different stages of construction and I will explain, in this article, the challenges we experienced with this one. All timber decks we build come with their own challenges and there are various techniques we use to overcome these challenges. Our first challenge here was that the paving alongside the pool was not parallel to the house. There was a difference of about 80mm over a distance of about 3m. If we had simply placed our deck boards down with equal gaps between them we would have ended with a wedged shaped deck board with a measurement of zero on one side and 68mm on the other side which would be unsightly. In order to overcome this one needs to vary the gaps between deck boards. total of 80mm that we will gain thereby reducing the difference on either side to zero. In effect you are “fanning” the deck boards to close the difference created by the wall not being parallel to the house. Simple hey? Not always so. Because each run of deck boards is made up of about 3 or 4 separate pieces it can be tricky to keep the runs straight whilst still “stealing” millimetres. At the same time you need to try to end on a full deck board instead of having to rip one deck board to half the width to finish decking the area. We weren’t able to do this because we were running out of space to start increasing or decreasing the gaps to end on a full board. So instead we installed a 90mm deck board on the last run to close the 32mm gap we had left. 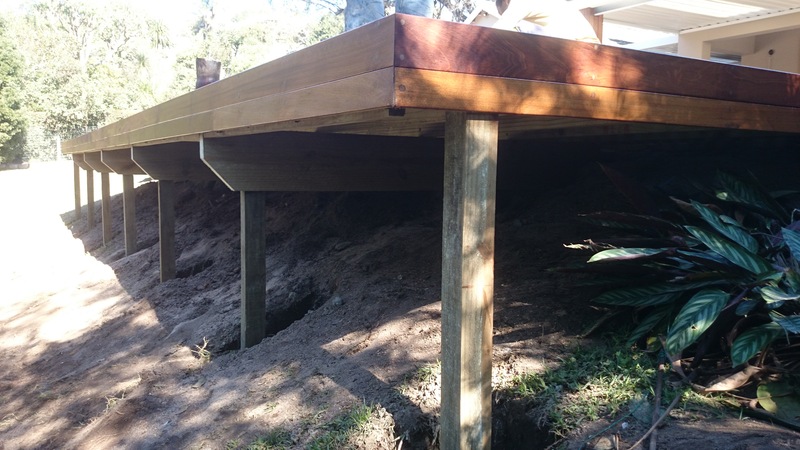 We built this timber deck in two sections and then filled the gaps in between. Some of it was on grass and some was on soil, so there was a mixture of posts in ground with concrete and posts on top of paving. Another challenge here was that because we were building flush to the pool paving AND the floor inside we had to check that the height of the pool paving and the height of the floor inside were the same. They never are because the world is not flat. While I prefer building as flat, level and square as I can, sometimes one needs to build slightly off in order to line up with other substrates that are not perfect, and they never will be. One needs to be careful though that by building off square and level does not affect the total build or the visual appearance of the structure. If it will, then another plan needs to be made. For a free no obligation quote on your sun deck and other outdoor related structure please contact us on 031 – 762 1795 or use the contact us form below. 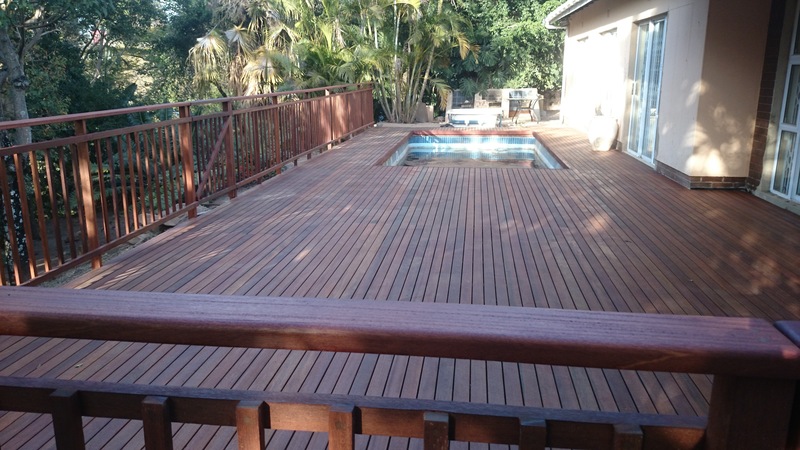 There are many wooden decking companies in Durban that one can choose from when planning to install a wooden deck. Some are reputable companies and some are not, as in any industry. Besides comparing price one should always compare services to make sure you are comparing like quotes. 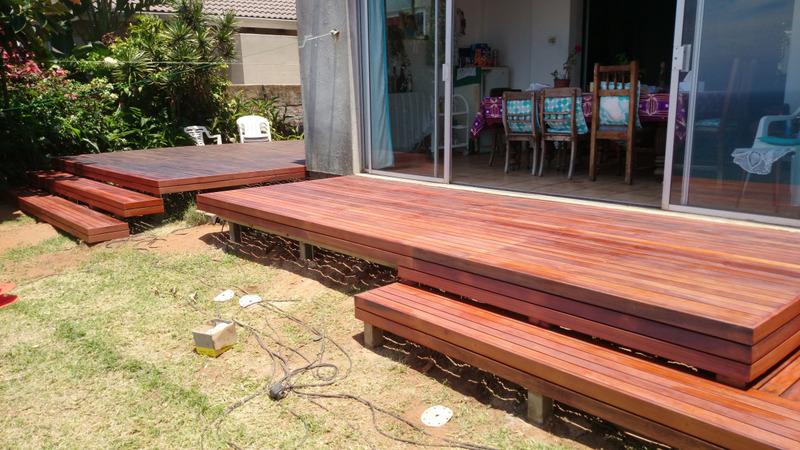 Some wooden decking companies in Durban for instance will offer to build you wooden deck as well as seal it and other will only quote to build it. Some will offer to fill the screw holes with epoxy to stop water getting in them which will cause rot and others won’t. It is these small things that one needs to ask about and make sure that the service being received from one wooden decking company in Durban is the same as the other that you are comparing to. Building the deck with quality yellow balau. We generally build our substructure out of H3 and H4 CCA Treated pine. This is not only due to a cost factor but also because the pine is correctly treated to H3 CCA level which has a life span of at least 50 years exposed to the elements. You can expect to pay about 40% more if you chose a balau substructure. H3 CCA Treated pine is guaranteed for 50 years if used in the correct application and installed correctly. It will therefore outlast balau as a substructure because the balau is not, and cannot be, pressure treated. I have often seen balau joists rotting from the top where the water gets trapped between the joist and the deck board. We always use balau deck boards as balau behaves better than pine on horizontal surfaces. Balau is a lot more stable and the pine tends to cup and warp over time with the constant hot and cold, expansion and contraction and occasional wetting. Our balustrades and stairs are all made from balau, unless otherwise specified, because if one uses pine as a balustrade, the pickets and cross supports need to be almost twice as thick as balau so they tend to look a bit too chunky. Balustrades do not work well in pine because of the knots found in pine which weaken the timber. We use a kalgard decking screw which is guaranteed for 25 years by the manufacturer against rust. The screws are counter sunk and the counter sunk hole is filled with epoxy and saw dust so as to match the colour as closely as possible. Filling the screw hole stops water sitting in that hole and travelling up the deck board along the grain. Exposure to water for too long will speed up the rot process. So we fill it, sand it flat, and seal the deck using an oil based sealer which contains no wax. This makes it easy and therefore inexpensive to maintain your deck going forward. I have done a few refurbishment jobs where the decking company has not filled these holes and on the older decks, the deck boards have started to rot there. These are all standard services we offer which are normally included in the price we quote. So when comparing our quotes to others, please check what value added services they are offering you. For a free no obligation quote on your wooden deck, pergolas, screens, walkways, etc. please contact us on 031 – 762 1795 or use the contact us form below. 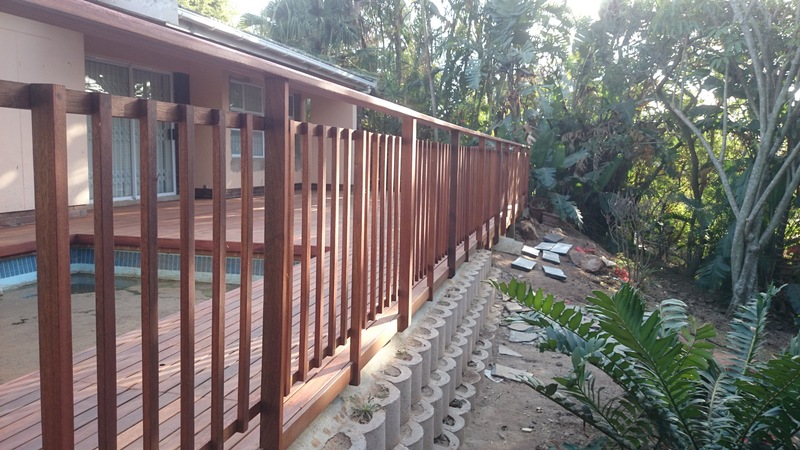 Here’s video of a wooden deck we built recently in Hillcrest, Durban showing the different stages of the build. Give us a call for a quote on your wooden sun deck, wooden pergolas, walkways, bridges, floors or fences on 031 – 762 1795 or use the contact us form below. 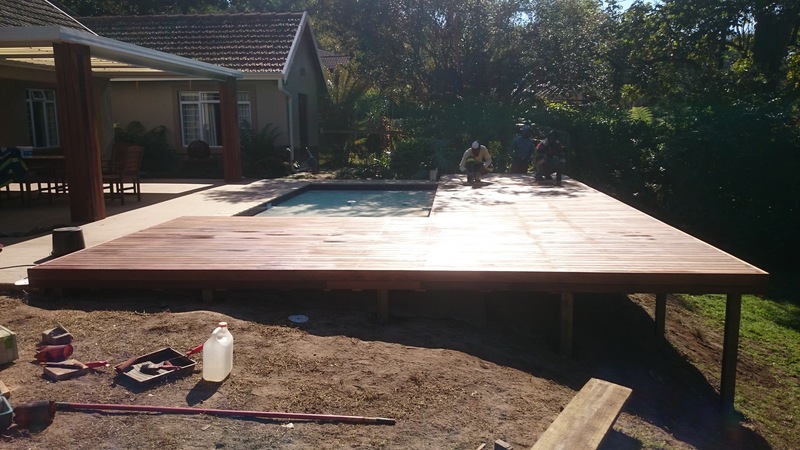 Here was a nice size wooden sun deck, or pool deck, we built of approximately 60m². I say a nice size because at that size one can reduce the costs slightly, pass a saving on to the client, and make a little bit more money on the job. 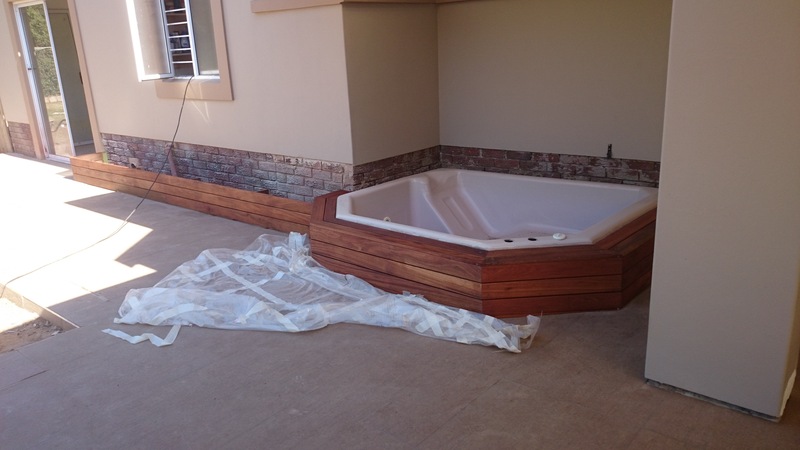 This wooden sun deck was built around the pool as you can see from the pics alongside. It also extended to the far end of the house and was enclosed by a balustrade on two sides with two gates leading to the garden. Access to the deck was from two bedrooms on one end in front of the pool and from the lounge on the other end. The level of the floors, in the rooms, near the pool, were not the same level as the level of the lounge floor so we were left with a choice to either step the deck or have a small step up to the lounge. We chose to create a small step up to the lounge because having a step in the middle of your wooden pool deck is only going to lead to someone tripping and hurting themselves. In this article I want to write about the different ways of laying the boards when it comes to pool decks or any other deck where the boards can possibly run in both directions. If a deck needs to be built with deck boards all running the same way it is relatively easy to install them in that the ends do not need to match up. 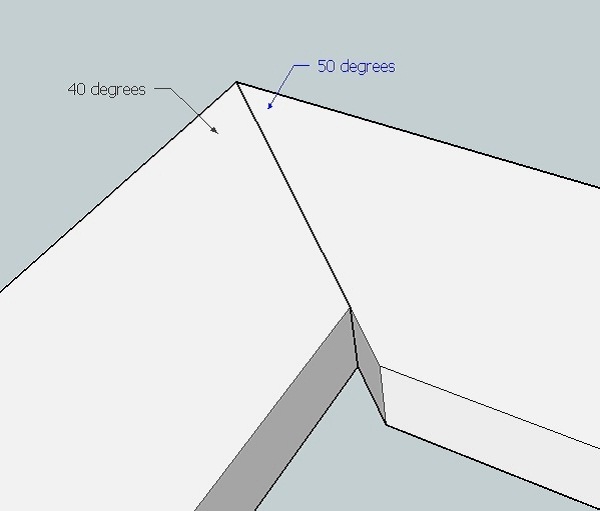 The problem one can have in trying to match up ends of deck boards is that if they are not cut at precisely 45° then the length of the cut ends will differ. I’ve drawn a sketch alongside to illustrate this. It is highly unlikely that any pool will be perfectly square. 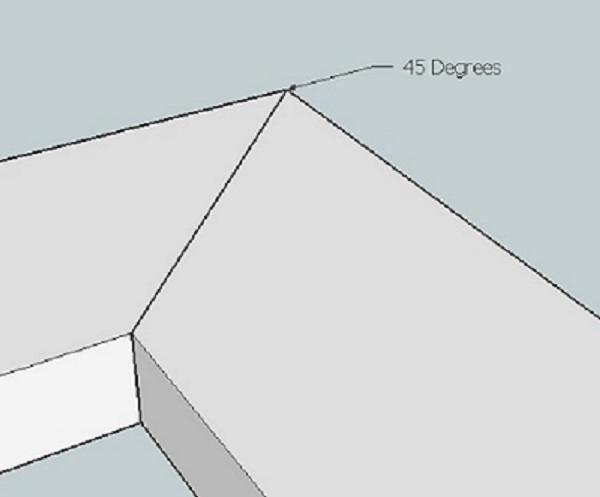 When installing the wooden pool deck it may be necessary to cut one end at say 44° and the matching board that runs at right angles to it, at 46°. The two ends will not be of equal length and will therefore not match up flush with each other. The problem is compounded with each deck board that is added. Let’s assume that the one cut end is 2mm longer than the other. After installing 15 deck boards (or one metre) the boards will have shifted by 30mm (15 x 2mm). This will be unsightly. The problem is also compounded by the variance from 45° which results in the difference in lengths of cut ends being greater. There is a way to overcome this problem and that is to install a joiner between the cut ends as the sketch alongside illustrates. The other way is to run the deck boards all in the same direction (i.e. not all parallel to the edge of all sides of the pool, but rather all parallel to each other). Another advantage though of running the deck board’s parallel to all edges of the pool, with corner joins, is that you will have face grain facing the pool and not end grain. Water is absorbed largely through the end grain of wood and if this end grain is facing the pool, then it stands to reason that the deck boards on this side of the pool will be exposed to more water and will tend to rot more quickly than those with face grain facing the water. Even though we use balau for our deck boards, which is rot resistant, all wood will rot and by employing methods that will inhibit rot, makes good sense. Having said all that, it is easy and cheap to replace deck boards and if a deck board with end grain facing the pool gives you 15 years life, the cost vs. preference is not that great. For a free no obligation quote on your pool or sun deck, or any other outdoor timber construction, please call us on 031 – 762 1795 or use the contact us form below. 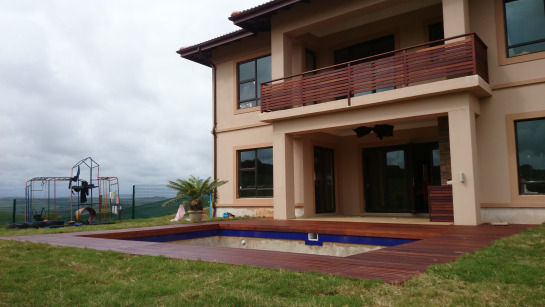 Here’s a balau wooden sundeck we’ve just built on Kloof, just inland of Durban. We used a 19 x 90 balau deck board on this wooden sun deck at the client’s request. We normally use a 19 x 68 balau deck board as they are considerably less expensive per square metre than the 19 x 90 balau deck boards and we can pass that saving on to our clients. Granted it is quicker to install a deck board that is wider as you need less boards per square meter (in this instance 15 boards per square metre using a 68mm wide board and 11 using a 90mm board), but not by that much that it warrants paying 35% more for it. 90mm boards are about 35% more expensive per square metre than 68 mm boards. every alternate shoulder. It does work, but if you do get a board that is particularly prone to warping it will warp where the one screw has been left out. It is not a huge cost or effort to put a second screw on the opposite shoulder of each board at each joist line. Obviously the wider the board the more prone it will be to warping. Why they are more expensive I haven’t yet worked out because good balau is good balau is good balau. If the wider boards we taken from a different part of the tree, the heartwood vs. the sapwood, then I would understand the price difference, but they aren’t. It is a preference, at a price, that’s all. We ran the deck boards all in the same direction on this wooden deck. With this deck we ran the deck boards parallel to the edge of the pool meeting each other at a 45° angle on the corners. It is far easier to run them all in the same direction as you will never get a problem of matching the cut ends. If one board is cut at 46° and one therefore at 44°, they will be of different lengths and will not match up. In this instance you need to install a barrier between then (one deck board’s width) to hide any difference in length between cut ends. But I’ll write another article about that later. Running them all the same way on both sides of the deck eliminates this problem. You need to be careful though to start installing your deck boards in the middle of the deck and not on one end. If you start on one end, you may very well reach the 90° corner and find that you have to rip a deck board in half to cover your space. This is unsightly and will result in that deck board failing more quickly than the rest. So start in the middle and move outwards to both ends and end with a full deck board. our substructure to bring it back to square. The cladded vertical posts you see in the pics alongside are 19 x 90 boards (x 3 of) around a 76mm steel awning post. We needed to build the steel awning post up to get to our 290mm and then attach it to the post. Although it looks very nice to have such bulky wooden posts, it does block the view slightly when sitting at the pool. Why 290mm when each board is 90mm (90mm x 3 = 270mm)? Because we set each corner chasing the other surface. And let’s just forget about the 5mm gap we had in between each board. For a free no obligation quote for your wooden sundeck, pergola, walkway, screens or other timber construction please use the contact us form below or call us on 031 – 762 1795.